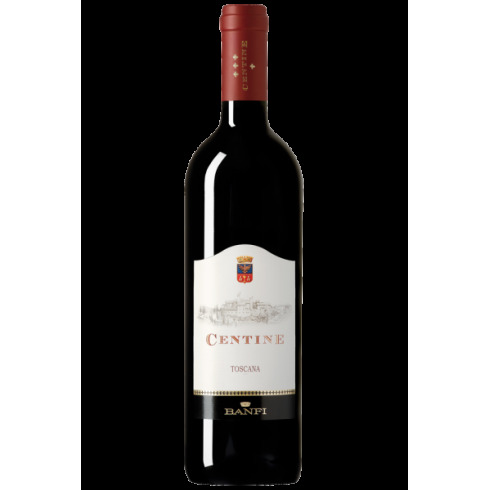 Centine Rosso Toscana I.G.T. from the recognized House of Castello Banfi in Toscana. An estate that is famous for its unique wine culture and tradition. This is a wine from the Banfi Toscana range which expresses the genuine and authentic character of Tuscany. These wines are appropriate for everyday consumption, yet always reflect the Banfi standard of character and quality. Grapes Sangiovese, Merlot, Cabernet Sauvignon. Maturation Aged for 4-6 months in small oak barrels followed by a few months in the bottles. Bouquet Intense, vinous and spicy in which the Tuscan character of the Sangiovese is perfectly combined with the international character of the Cabernet and Merlot. Pairs with Roasts, game and medium aged cheese. Serve at 16-18 C.
The Castello Banfi estate is nestled between the Orcia and Ombrone rivers on the southern slopes of Montalcino in Tuscany. The wines of Banfi Toscana range are produced with grapes selected from specific Banfi vineyards as well as other noble areas of the region. The Sangiovese, Cabernet Sauvignon and Merlot vines grow in sandy, calcareous and rock filled vineyards. The grapes were vinified with a brief maceration. Once the alcoholic and malolactic fermentations were completed, the wine aged for 4-6 months in small oak barrels followed by a few months in the bottles.